When Dante spoke of the Seraphim—the first of the nine choirs of Angels—the color that "glows" was the pure orange vermillion which his fellow citizens and brothers-in-spirit (the painters, illuminators, and glassmen) knew as RED. So it may be said that pure RED is the color of divine love, of the Holy Spirit, of courage, self-sacrifice, martyrdom, and all the warm impulses that belong to the greathearted everywhere. RED is the warm, active color. 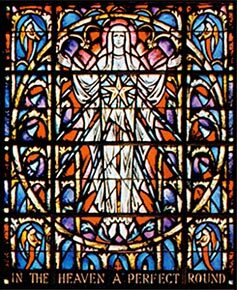 The BLUE-winged Cherubim—the second from the throne of God in the Choir of Angels—symbolize God's wisdom. The BLUE of the Middle Ages was a pure cobalt, often shading from deep to light, approaching sapphire. "BLUE is the light of heaven; BLUE is the cool, contemplative color, the perfect foil for red." BLUE is also symbolic of profound meditation, of enduring loyalty, of eternity. GOLD (or YELLOW) is the symbol of the sun, of the goodness of God, of treasure in heaven. GOLD is the color of spiritual achievement, of ripe harvests, or the good life; and, as it merges into golden browns and orange tans, it recalls the good treasures of the earth. GREEN, uniting the "wisdom" of blue with the "wealth" of gold, symbolizes hope and victory over dullness and ignorance; GREEN symbolizes happiness and the gaiety we associate with springtime and youth; it symbolizes good humor, fun. WHITE is the color of serenity and of peace, of purity and of the joy that belongs to the pure in heart; WHITE is the symbol of faith as well as of innocence. VIOLET (or PURPLE), uniting the "wisdom" and "love" symbolized by blue and red, is the symbol of justice and of royalty. PURPLE also stands for suffering and mystery and was the glassman's color for black, expressing negation, mourning, and death. When set forth with white, it stands for humility and purity. Adapted from: Charles J. Connick, "The Language of Stained Glass," Advance, CXXXVI, No. 4 (April, 1944), 6.